On Tuesday, January 31, asteroid 433 Eros will come closer to Earth than it has in 37 years, traveling across the night sky in the constellations Leo, Sextans and Hydra. At its closest pass of 16.6 million miles (26.7 million km) the relatively bright 21-mile (34-km) -wide asteroid will be visible with even modest backyard telescopes, approaching magnitude 8, possibly even 7. It hasn’t come this close since 1975, and won’t do so again until 2056. 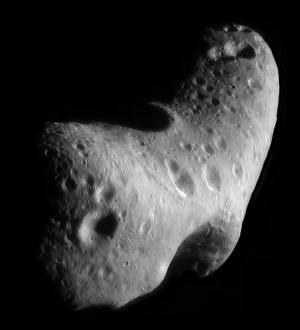 Asteroid 433 Eros is an S-type asteroid, signifying a composition of magnesium silicates and iron. Eros was discovered on August 13, 1898, by astronomers Carl Gustav Witt in Berlin and Auguste Charlois in Nice. Although Eros will be making a “close” approach to Earth on January 31/February 1, there is no danger of a collision. It will still remain at a very respectable distance of about 16.6 million miles (26.7 million km), or 0.178 AU. This is over 80 times the distance of the much smaller 2005 YU55, which safely passed within a lunar orbit radius on November 8, 2011.